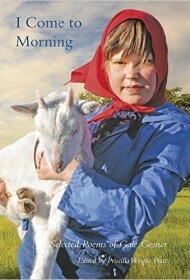 I Come to Morning is an aesthetically pleasing poetry collection penned by the late Gale Gesner and lovingly assembled by her long-time friend, Priscilla Wright Pratt. Written in both free-verse and rhyming lyrics, these poems celebrate family, friendship, spiritual redemption, and the beauty of the natural world. Gesner died in 1983 at age 30, according to the jacket flap. The touching biographical material, moving tributes by Harvena Richter and Robert Peel, cover and photographs of Gesner at various ages enfold readers so fully in the poet’s life and untimely death that her poems are harder to appreciate purely as artistic endeavors. Yet, Gesner’s talents are obvious, and the collection reveals a promising young poet attuned to sensuous, concrete details. Gesner is at her best when bringing landscapes to life. Examples of her vivid imagery include: “strawberries in January/ and carnations in the snow”; “Spring earth is yielding now/ and giving up/ its rocky fruit”; and the haiku “Ripened apple tree/ Fresh painted barn, setting sun,/ Red on Red on Red.” Less effective are her poems that forego images altogether, telling readers something rather than showing: “You can never duplicate/ an idea/ but you can express one idea/ infinitely…” Her religious poems tend to be more simplistic and less imaginative in diction and style—“Let me live it to Thy praise/ So let me live all Thy days”—than her nature poems, which are striking and original by comparison (“Rise on wings of the crow,/ wings which scallop the sun,/ cutting black shadows on noon”). As is, I Come to Morning offers an uneven mix of work. The editor might consider separating the light religious and inspirational verse from the more innovative nature poems, in order to target different audiences and, in the case of the nature poems, create a more effective showcase for Gesner’s talents. Nonetheless, readers will find much to appreciate here from a poet whose promise was extinguished far too soon.